More than 60 bands and acts descend on Governors Island for a day of folk, bluegrass, country and plenty of dancing. Grab a bite from vendors on the lawn, and head toward the stage for square dancing with NYC Barn Dance, a bluegrass jam with the Brooklyn Bluegrass Collective and performances by the Kneeling Drunkards and many more. Governors Island, Nolan Park (porchstomp.com). Sat 17 noon–5pm. Looking for a California-backyard-party vibe, complete with carne asada and élotes on the grill? Well, then head to Str8 West Coastin’, where you’ll find expert selectors Still Life, Eleven and Dopeshoes playing only West Coast tuneage from the likes of Dre, Snoop, Cube, E-40 and Too Short. 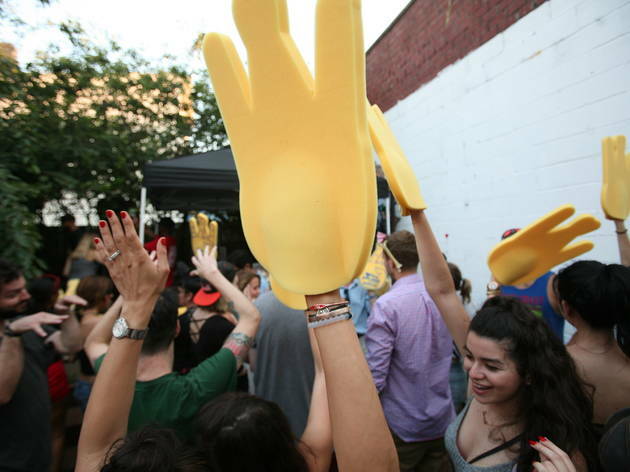 Snag top-notch swag like W-shaped foam hands (for Westsiiiiide), Tupac beer coozies, temporary tattoos while munching on some finger-lickin' BBQ. The party is totally free, but make sure to R.S.V.P. in advance. 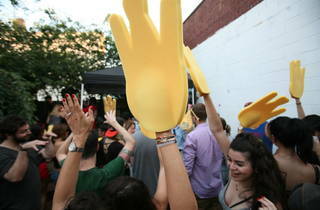 Project Parlor, 742 Myrtle Ave (347-497-0550, str8westcoastin.splashthat.com). Sat 17 at 2pm. The Puerto Rican, Jewish and Chinese communities of the Lower East Side come together for this fest, at which you can learn how to make challah bread, dumplings and empanadas, enjoy performances from folk artists, and eat some of the neighborhood’s best local bites. Museum at Eldridge Street, 12 Eldridge St (212-219-0302, eldridgestreet.org). Sun 18 noon–4pm. Still can’t get over the French romance of this tale as old as time? Show your love for Beauty and the Beast over several rounds of trivia that cover the 1991 animated classic. Bring up to four teammates to answer questions about provincial towns, enchanted castles and talking armoires. The Dubliner, 45 Stone St (212-785-5400, triviaad.com). Sun 18 noon–1:30pm. Every Monday this summer, Hotel Hugo’s rooftop bar Azul hosts breezy viewings of some of your favorite movies, made all the better with 360-degree views of the city and delicious tacos. Check out last year’s La La Land, starring Ryan Gosling and Emma Stone. 525 Greenwich St (212-608-4848, hotelhugony.com). Mon 19 at 8pm. Man Time Out is a shell of it's former self, How in the world is The Mermaid Parade with Debbie Harry and Chris Stein as royalty, not on the top of this list, let alone, not at all? Come singalong, drink-along, dance-along & laugh-along, ALL NIGHT LONG!